The Avon Old Farms Hotel merges the spirit of historic New England and the character of a world-class hotel. Decorated with fine furnishings. antiques and original watercolors of local scenery. Avon Old Farms Hotel features 157 luxurious guest rooms many with four-poster beds. Award-winning dining is available in Seasons Restaurant and English-style pub. 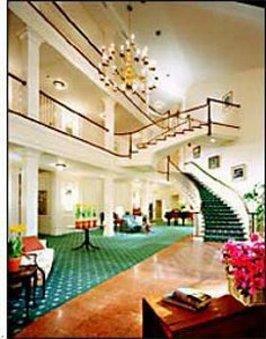 The hotel is situated at the base of Avon Mountain in a 20-acre setting with manicured grounds. brick walkways and colorful gardens. Relax by the lovely outdoor pool or take a sauna in the exercise room. Area amenities include golfing. canoeing. tubing. skiing. museums. theater. antiquing. and specialty shopping. In the heart of the Farmington Valley is the Avon Old Farms Hotel. A fine Georgian Colonial-style property on 20 beautifully landscaped acres. the hotel features rooms furnished with luxurious feather beds. down comforters. coffee makers. telephones with voicemail and upscale amenities. Pastries. fruit and coffee are complimentary each day. Guests are invited to utilize the exercise room. sauna and outdoor pool. Over 6000 square feet of generous meeting space can be set according to your specific requirements by professional. experienced conference staff. The handsome Towpath Ballroom with four season Terrace and five smaller meeting rooms graciously accommodate up to 150 attendees. Carrying the highest Zagat restaurant rating in the area. Seasons Restaurant and Pub's award-winning cuisine is guaranteed to exceed your guests' expectations. Just 10 miles west of Hartford. 30 minutes from Bradley International Airport and two hours from Boston and New York. the hotel is the perfect coupling of charm. distinct architecture and well-manicured surroundings in an environment dedicated to customer service. Airport shuttle by appointment only.